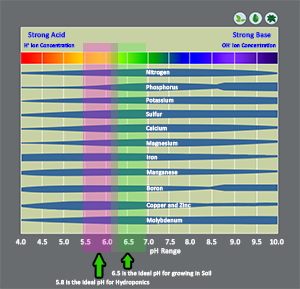 The ideal pH range for most hydroponic crops is between 5.5 and 6.3 with 5.8 being the standard pH value for most crops. What pH is best for growing plants in soil? The ideal pH range for most soil grown crops is between 6.0 and 7.0 with 6.5 being the standard pH value for most crops grown in soil. pH is important because it affects availability and absorption of the nutrients required for plant growth. In hydroponic culture, maximum absorption of these nutrients is typically at a pH of 5.8. In soil culture, maximum absorption of essential nutrients is typicallly at a pH of 6.5. When pH falls below this range many of the macro elements (N, P, K, Ca, Mg, and S) have less availability and Macronutrient deficiencies will develop. When pH values rise above this range, many micronutrients (Fe, Mn, B, Cu, Zn) become unavailable for plant uptake and micronutrient deficiencies will develop. How are pH levels managed in hydroponic nutrient solutions? pH is adjusted by using an acid to lower it or a base to raise it. Blue Planet Nutrients pH Down and pH Up are designed for this purpose. Many acids and bases are extremely corrosive and dangerous, so care should be used if you are not using a product labeled for hydroponic use. 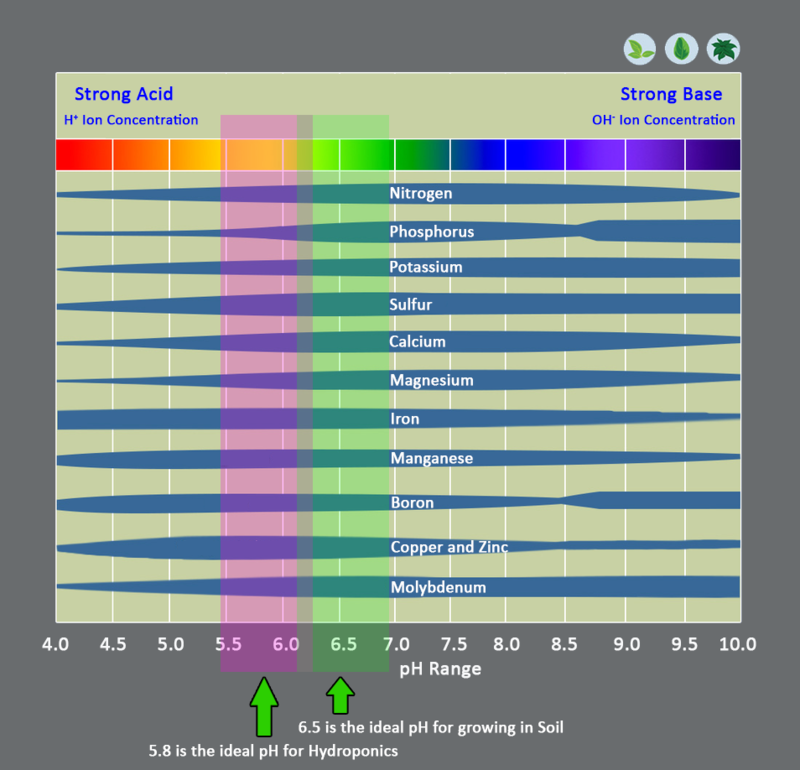 How are pH levels managed in soil? pH can be measured in soil by measuring the leachate as it drains out of the bottom of a pot after watering or feeding a plant. The best way to adjust the pH of a soil solution is to adjust the pH of the nutrient solution up or down before feeding to the plant. The leachate (liquid draining from the bottom of containers) should consistently have a pH of 6.5. Adjust the nutrient solution that you are feeding to plants grown in soil by using an acid to lower it or a base to raise it. Blue Planet Nutrients pH Down and pH Up are designed for this purpose. When first starting out it's a good idea to measure the pH of your water every day until you get a feel for your system. Measure your water and then add your nutrients. Within an hour check the pH and adjust accordingly. Repeat this process until pH stabilizes. Both the Elite Series 3-Part and the Blue Max 2-Part contain special pH buffers to help maintain a desirable pH. It is a good idea to note how much water, nutrients and pH modifiers are needed to obtain the desired values. After several "start- ups" you can generally get a feel for how much acid or base to use for your situation. Frequently, pH stays within a desirable range for a considerable time, and then rapidly rises or falls to an extreme. This is usually an indication of the need to do a nutrient change. If you are using hard water, pH has the tendency to climb above 7.5. If you are using hard water with a starting ppm value of greater than 200 PPM, it is advisable to purchase a Reverse Osmosis water filtration system to produce pure water. Blue Planet Nutrients pH UP and Down is very concentrated. Start out by adding just a drop or 2 per gallon. Stir and wait about 5 or 10 minutes, and test your water again. Frequently you will only need 1 to 2 ml of pH Up/Down per gallon of water. You may need additional pH Up/Down if you have hard water. Blue Planet Nutrients 3-part and 2-part base nutrients are pH buffered to facilitate keeping the pH in a favorable range. The easiest way is to continue adding pH Up. This is generally fine because the additional elements that are added are potassium ions. Potassium is frequently the highest element in hydroponic nutrient solutions. Sometimes pH crashes because of the presence of a large amount of microbial activity in the nutrient solution. This is usually a result of poor maintenance of the system due to infrequent nutrient changes or other stresses. The best way to avoid this scenario is to keep a clean system with adequate nutrition. Other times, rapidly growing plants can rapidly change the ionic ratio of various nutrients causing an imbalance causing large fluctuations in pH. For instance, if a plant is favoring nitrate over ammonium ions, then the pH of the nutrient solution could drop rapidly. The best fix for this is to continue to add pH UP or to dump your reservoir and add fresh nutrients.